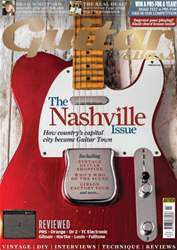 Nashville is synonymous with the kind of crisp country cleanliness that the Fender Custom Shop Masterbuilt Yuriy Shishkov ’55 Tele on this month’s cover delivers in abundance. Yet these days, ‘the Nashville sound’ could just as easily refer to the explosive fuzztones of Jack White and Dan Auerbach. And there’s a lot more to that gorgeous Telecaster than just twang, too.